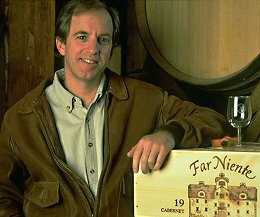 I was first introduced to the wines of Far Niente in a rather round-about way. On holiday in California in the mid-90’s, a sommelier recommended I try a glass of a dessert wine called Dolce”, in preference to the Sauternes I was about to request. The 1994 Dolce was indeed superb: a botrytis-affected Semillon/Sauvignon Blanc of wonderful richness and style. A little investigation revealed that Dolce is a sister wine to Far Niente, an estate famed for its ultra-premium Chardonnay and Cabernet Sauvignon. I have tasted both Dolce and Far Niente’s Chardonnay and Cabernet on several occasions since, each time being impressed by their blend of opulence and finesse. All of Far Niente’s grapes are estate-grown (they own some of Napa’s best vineyard sites) and hand picked. Ageing is in French oak, handling is according to traditional French practices, with labour-intensive attention to detail like lees-ageing and egg white fining. On the team since 1982, Dirk Hampson now heads the operation as Director of Winemaking (for both Far Niente and Dolce). I was invited to meet up with Dirk on Far Niente’s stunning stand at Vinexpo, Bordeaux. With acres of polished wood, brass and leather, the clubby stand was a very obvious sign that these are wines made with a single-minded focus on luxury; premium wines with little room for compromise. Indeed, the high cost of Far Niente’s wines is often commented upon by critics. Dirk came to Far Niente with impressive credentials, having learned his trade at Schloss Vollrads in the Rheingau, Labouré-Roi in Burgundy and as the first American winemaking apprentice at Château Mouton-Rothschild in Bordeaux. Dolce was his creation, an outcome of his constant experimentation with his vines and winemaking. Today he leads a team of three winemakers in three branches of the business, but he retains an ever-present hand on the tiller of each. Much of Far Niente’s Chardonnay was re-planted after the phylloxera infestation that struck Napa in the 80’s. Dirk is philosophical, saying that this was an opportunity to choose the five or six vine clones he thought would afford most complexity. The vineyards have so far escaped the two more recent scourges of the Napa Valley, Pierce’s Disease and the Glassy-Winged Sharpshooter bug. Unusually in the New World, the Far Niente Chardonnay does not undergo malolactic fermentation, which helps give the wines suppleness and freshness. The Cabernet Sauvignon vineyards in Oakville and Coombsville are in prime sites, next to Opus One and the Mondavi Reserve vineyards for example. The Estate Cabernet contains small percentages of Merlot and Cabernet Franc. The wine has a long maceration to soften its tannins, and spends around 20 months in either 100% new French barriques, or a lower percentage according to the vintage properties. In 1997 a new winery was established by Dirk, Larry Maguire and Gil Nickel (owner and founder of Far Niente). The winery, called Nickel & Nickel, produces small amounts of single-vineyard varietal wines. Though initially working with Merlot, Cabernet Sauvignon and Zinfandel, the model for Nickel & Nickel is in fact Burgundy; or rather the ability of vineyard sites to impart a definite thumbprint on wines they produce. It is true these wines are expensive. But they are made from prime fruit and “grand cru” vineyard sites, with lavish attention to detail. In the end, it is how they taste that counts and the wines do not falter on that score.Guide prices are given in Pounds Sterling (£10=$US15). UK importer is Hallgarten Wines (01582 722538) who can advise of stockists, but these include virginwines.com, casevalue.com and discover-wines. Nice nose with moderate oak giving a sheen of vanilla over apple and pear fruit that has just a touch of green bean, vegetal quality. The full, sweet palate is medium bodied but has a rich texture, with orange and peach fruit, some juicy apricot and hints of sweet tropicality. This is a powerful wine with a weight of broad, juicy acidity and has good length. Very good. I had tasted this previously in February 2001. The nose is immediately much more integrated, slightly cabbagy and super ripe, there are also complex hints of gravel and mineral as well as lovely sweetness of fruit: juicy peach, plum and greengage. This has good fruit on the palate, medium to full body and a great sweetness as it strikes the palate. It finishes with savoury depth and has lovely balance. Very good indeed. Dolce has fallen foul of import restrictions that prevent certain New World dessert wines from being sold in the UK. Those restrictions are being lifted, so I hope Dolce will be available soon. It retails in the US at $75 per 37.5cl. The ’98 has an alluring peach, apricot and creamy botrytis nose of fig, quince and honey. There is plenty of power and concentration on the palate, with apricot kernel notes and sweet, tropical fruit flavours, orange and marmalade. This has good citrussy acidity, and a rounded, generous mouthfeel. It finishes with lovely integration and should develop well. Very good indeed. 45% of the ’98 Cabernet harvest was de-classified and sold off. This wines opens with a burst of minerality on the nose, which is perfumed and savoury, displaying some meaty aromatics. Aged in 75% new oak, there is sweetness lying beneath. On the palate a wonderfully sweet, rich attack with plenty of spicy red and black fruits. Medium to full bodied, there is plenty of grip from dry, silky tannins and a smoky quality in the finish. Good acidity. This is complex, but needs a little time. It is very good indeed. This has a sweetly complex nose that suggests ripe black cherries, woodsmoke, gravel and lush black fruit. Beautifully sweet palate with deep, luscious black cherry fruit this is much more resolved and quite elegant. Like the ’98, a dry tannic structure and a smoky element dominate the finish, but this is drinking well and is a really lovely wine. Very good indeed. This is only the second release of this wine, which retails at around $70US, and is thus far unavailable in the UK. Less than 300 cases are produced. It has a briary nose of tobacco, woodsmoke and herbs, with sweet black fruits and an overlay of toasty oak. On the palate that lovely lush, sweetness of ripe fruit washes over the palate, with expansive and gentle acidity adding bite as well as a push of spicy oak that gives plenty of stuffing. Finishes stylishly, with some grip from ripe tannins, and well-focused fruit. Very good indeed.